It’s just an average day at home as you bend down in the kitchen to pick up the spoon you dropped, only to find that it has landed in a corner–and it isn’t alone. It is accompanied by a few tiny little friends. Ants! And you know where there are a few, there are likely many more of them hidden away in a colony out of your sight but usually in your home. Of course you want to find something effective and safe to get rid of those creepy crawlers. Look no further than Borax Ant Killer. You’ve found the exact site you need! Keep reading. I promise you won’t be disappointed, as this is the ONLY site on the entire world wide web that focuses solely on how to use borax as an ant killer. Heading to the pesticide aisle at the grocery or hardware store might be your first instinct, but wait a minute and think. Do I really want pesticides in my house? Dangerous chemicals which kill ants could possibly harmful to the family as well as pets. Instead, research a natural product which is family friendly but is certainly lethal to ants: Borax. First of all, what is Borax and how does it get rid of ants? Borax is actually the salt from boric acid, and it comes in a fine white powder. Borax is actually most often used as an alternative to harsh, chemical filled laundry detergents. And while it is safe for humans and pets, it is fatal when ingested by creeping pests such as ants due to negative effects on the ants digestive system. Using boric acid salt has been a natural and effective means of controlling ant populations for hundreds of years. Tracing the trail of how the ants got into your house will likely offer stronger odds in getting rid of all of them. While stepping on the one you see may kill that one, there are always friends around which you cannot see. (For every ant you see, there may be thousands of other ants in the colony, including one or more egg-laying queen.) Instead, targeting the areas of entry will cut off any new ants from coming in and also prevent the ones already inside from escaping and coaxing their friends back into your house. The most important ant to get rid of in order to eliminate the colony is the Queen Ant. She’s sort of like the queen bee in that her job is to make more little ants. She doesn’t venture out into the world like the other ants do. Instead, the other ants go out in search of food and bring it back to the queen ant. This will stop the reproduction of future ants coming from that nest. So if you want to get poison to the queen ant, you’ll need to get the other ants to carry it to her, by disguising it as food. While sprinkling borax around the perimeter of the house or building may deter ants from entering, in order to actually kill them you will need them to ingest it. This happens by giving it the appearance (and odor) of food. When disguising the poisonous boric acid salt as a food source, you want to use the proper ratio of poison to food in order to get the most effective results. The best way to do this is by creating homemade ant traps. The main ingredients for creating the perfect homemade ant traps are borax (of course), water, sugar, and syrup. Find the borax in the laundry aisle of most grocery or discount stores, with the most popular brand being 20 Mule Team. The sugar used in the mix should be plain, white, granulated (not powdered) sugar, and the syrup that works best is some sort of sticky, sweet syrup such as maple flavored syrup (artificial–don’t waste the pure stuff!) or corn syrup. Combined together, these ingredients create a fragrant concoction which is irresistible to ants and will ultimately be their demise. Start by preparing containers to put the poisonous mixture into. Small plastic containers such as baby food containers, applesauce pods, paper plates, or plastic lids will all work. You may find that you prefer one of these over the other and can experiment to find which you like best. Whatever containers you use, you’ll need to provide a way for ants to enter and exit the trap by drilling or poking holes in the container. This can be done with a pencil, pen, screwdriver, drill bit, or other sharp object. Holes should be placed around the tops and sides so that ants can crawl through but the mixture is not susceptible to leaking out of the holes. The recipe for homemade ant killer is three parts sugar to one part borax. This means that one cup of sugar can be used with ⅓ cup of borax. Mix these ingredients in a bowl to be sure all lumps are crushed and loosened. Add enough tap water to make the mixture thick and pasty, without being runny. Around ¼ to ⅓ cup of water should be sufficient to attain this consistency. Using a fork or whisk, stir the water into the mix and then add approximately ¼ cup of syrup to the mix. This should create a thick goo which will be irresistible to any household ant. Once you have created your mix, fill each container about halfway so that the yummy aroma will draw the ants right to it. Place the traps in strategic spots where you have determined ants may have found an entrance or exit around your house or building. Ants will enter the traps and will hopefully take the food source back to the nest where the other ants (particularly the queen) will ingest it and die. Make sure to check out our complete Step-by-Step Instructions (with pictures) for how to make these homemade ant traps. When your ant problem is gone, instead of keeping a harmful can of ant pesticide around the house and worrying about the safety of your children finding it, you’ll simply have the leftover borax to store. You can even use the rest of the borax to make your own laundry or dish washer detergent. 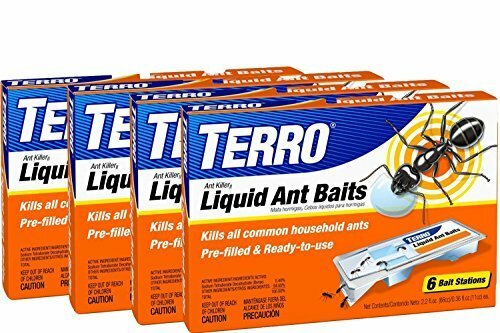 If you think this sounds messy and you would rather just purchase ant killer at the store, take a minute to learn about some of the harmful ingredients which are included in many ant traps on the market today. If you are considering using an ant spray (also often recommended for roaches), you will likely find that it contains Pyrethroids or Pyrethrins, which are chemicals related to kerosene that can be toxic for pets and children if inhaled. This is why instructions for use indicate that children and pets should be removed from the area of use, and the area should be well ventilated. Inhalation can cause side effects such as coughing, wheezing, chest pain, shortness of breath, runny nose, or difficulty breathing. When these chemicals come in contact with the skin, a rash or blisters may form. And although long term contact is unlikely, these chemicals are known carcinogens and can create problems with the thyroid gland as well as female hormone problems. Because many children each year are poisoned by harmful pesticides, it is recommended to store these in a place where children do not have access to them. However, it may be even better to not have them around your house at all. Instead, try a safe and harmless type of homemade pest killer such as the borax recipe above. Although borax seems to be the most effective ant control remedy, other natural ant control options have been tried. Rachel of Small Notebook suggests that cinnamon sticks and garlic cloves placed in ant pathways will be natural deterrents for entrance into your home. Another option uses white vinegar or apple cider vinegar sprayed on areas where ants have been spotted. Because the ant trail commonly leaves a scent to clue other ants to follow along, vinegar blocks the scent and keeps the other ants from being able to follow the trail. Boiling water poured onto ant hills outside has been used effectively to kill the ants in the colony. Other plants with strong scents which are known to repel insects such as ants include black pepper, basil, eucalyptus, lavender, peppermint, and rosemary. Other suggestions for home remedies to control ants includes sprinkling used coffee grounds or cayenne pepper around the outside of the house, leaving citrus or cucumber peels in the areas of known ant activity, as well as sprinkling a line of baby powder or chalk around the places outside the house where the ants are entering. Ants have an exceptional talent for finding little particles of food which are left anywhere around the house. The kitchen is particularly susceptible to ant invasion, with counters and floors collecting crumbs or sticky areas that are attractive to ants. Keeping the kitchen clean and wiped down helps a great deal. Another way to control the ants in the house is to keep food out of areas of the house other than the kitchen. Even a piece of popcorn dropped in the living room during movie night may invite an army of ants in to carry it off for a meal. Limiting food to the kitchen (particularly when the household has children) will keep the ant population under control in the rest of the house. With borax ant killer, you have found a simple and safe solution to your ant problem without having to use harsh chemicals or expensive traps from stores. Homemade borax ant traps are an inexpensive, and easy solution to your problem. You can rest easy knowing that your borax ant killer is working overtime, and that your family and pets are safe and healthy while protected from a continual invasion of pesky and dirty ants.